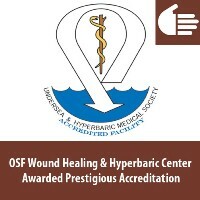 The OSF Wound Healing and Hyperbaric Center has achieved accreditation by the Undersea Hyperbaric Medical Society (UHMS), following a lengthy application and site-survey process. It is one of only three facilities with this accreditation in Illinois. Accreditation from the UHMS is recognized by the Joint Commission and holds a facility to the highest performance standards with a demonstrated commitment to patient care and safety. The OSF Wound Healing and Hyperbaric Center received a Level 2 certification for providing high-quality care Monday – Friday in an outpatient setting. “Being a UHMS-accredited program provides peace of mind for our patients, knowing that they are receiving excellent care in a facility which meets the high performance and safety standards required for accreditation,” said Andy Chiou, MD, MPH, medical director of the center. During the accreditation survey, the UHMS sent a team of experts to the facility, located in the OSF Center for Health – Route 91 in Peoria, to examine staffing and training, documentation, equipment installation, operation and maintenance, facility and patient safety, and standards of care. The expert survey team included two hyperbaric-certified physicians and a certified hyperbaric registered nurse. The OSF designation is good for three years. Click here to learn more about the services at the Wound Healing and Hyperbaric Center.